Official bout poster for Saturday's event. Turkey, Bacon, and Avocado cancelled on Church, so they are now playing a mash-up bout. Poster courtesy of the Emerald City Roller Girls. Editor's Note: Every week or so, I will likely publish a roller derby article. If roller derby is not your cup of cake, then I strongly recommend you skip over these articles. I will be sure to warn you ahead of time that the article is about roller derby, so you can avoid wasting precious moments you could have spent looking at pictures of food on Facebook. On the heels of a very successful Big O tournament last month, the Emerald City Roller Girls' home teams prepare for the final bout of the season. 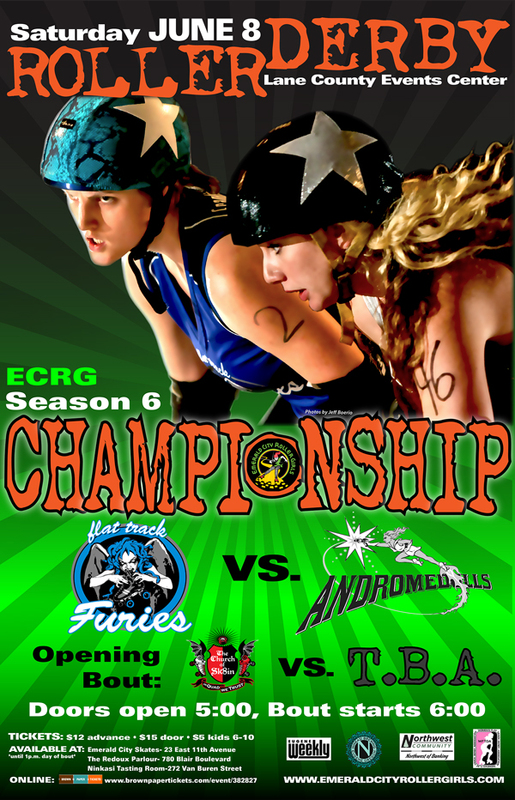 In the ECRG Championship, the four-time defending-champion Andromedolls will play the Flat Track Furies. The game takes place this Saturday, June 8th at the Lane Events Center Performance Hall. As is the case for all of ECRG's 2013 bouts, a portion of the proceeds from the bout will go to Womenspace to help the victims of domestic violence. The first bout on the docket this Saturday is a mash-up of third-place Church of Sk8in, who finished winless in four home season bouts, and other ECRG skaters who are not playing in the Championship game. It is billed as “Church versus Sk8in” because the teams are primarily composed of Church of Sk8in skaters. This is the first time in four years Church of Sk8in has not made it to the Championship bout. Since they did not know for sure they were out of the Championship until April, Church had a hard time finding an opponent on such short notice. After having no luck searching the entire Pacific Northwest, they decided to put together this fun mash-up bout. Crowd favorite Jala Pain Yo will take the track in Church vs. Sk8in this Saturday. Photo by Jeff Boerio (rockinbdigital.com). The Championship bout will follow soon after the above game. The Flat Track Furies and the Andromedolls have identical records this season (three wins and one loss) and split the two bouts they played against each other. In their first meeting, in the season opener, the Dolls squeaked by with a 153-142 victory. In April, the second contest was nowhere near as close. Despite being behind at halftime, the Furies dominated a bout closed to the public to win 258-150. This Saturday, blocker extraordinaire Rex Havoc makes her return to the Andromedolls. Former ECRG President Rex has not bouted with the Dolls since 2011. Last year, Rex played solely for the travel team. This year, she has been recovering from surgery. Her doctors cleared her to play just in time for the Championship bout. Rex Havoc, middle, assists two of her teammates on the travel team. Photo by Jeff Boerio (rockinbdigital.com). 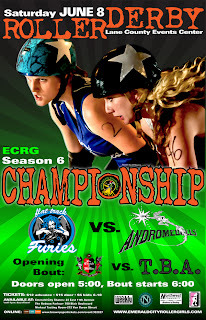 This is the Furies’ first time to the Championship since 2009, when they narrowly lost to the Andromedolls. This will be the final chance to see the ECRG home teams in action this year. There will be food, beer, raffle prizes, and plenty of fun for the whole family. Fans will also have the opportunity to meet and get pictures with the roller girls. 1. Cheap Ticket Night! This Friday, June 7th from 4pm to 7pm at Emerald City Skates (23 E. 11th Ave.) get your tickets straight from a roller girl for $10. 2. Stop in to the Redoux Parlour (780 Blair), Ninkasi (272 Van Buren), or Emerald City Skates during regular business hours for $12 tickets. 3. Visit Brown Paper Tickets. 4. Buy tickets at the door for $15 ($5 for kids 6-10, free for kids 5 and under). Can’t make it in person? Tune into the live video stream. Doors open at 5, and the action starts at 6.